I should really have started with this post, since it is what this blog is really all about – how to achieve true health and happiness. There is loads of information about what it means to be happy and how to be healthy, but it can be confusing, overwhelming and it generally focuses on specific details without presenting the big picture. It’s the big picture that I am really interested in, because only when you understand the big picture can you make informed decisions about the finer details. So what is the big picture of health and happiness? I believe that it is really very simple. 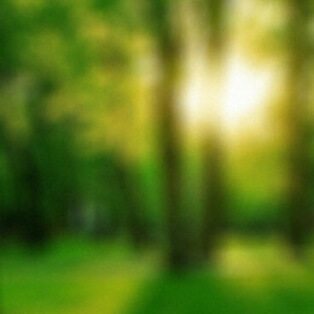 Firstly, I believe that health and happiness are not separate things and in fact part of the same whole. In fact, I would go as far as to say that they are the same thing. When you ave a healthy mind and a healthy body, you will find your happiness. So to achieve happiness, we must pursue health. I believe that there are 3 fundamental elements of good health, which I call the Health Triangle. Like the Fire Triangle, which requires a combination of heat, oxygen ad fuel to burn, our own health requires a mixture of positivity, nutrition and movement. If you take any one of these elements away you cannot achieve optimal health. The one other thing that we need is freedom from the attack of mental and physical toxins from the world around us, so that we can operate in a pure environment. If you think positive, eat well, keep active and avoid physical and mental toxins, then you have the perfect conditions for good health. It really is that simple. So what exactly do I mean by Positivity, Nutrition, Movement and Toxins? 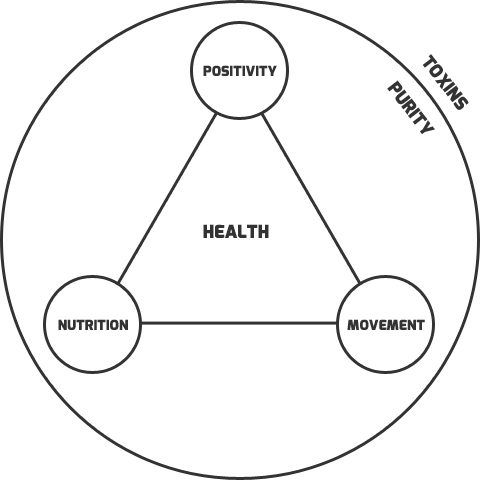 I put positivity at the top of the triangle because it s your mind that ultimately guides your nutrition and movement, as well as having a direct impact on your physical and mental health. On a simple level, positivity means looking on the bright side of life and focusing on the good, but there is more to it than that. A positive mind is one that is optimistic but also able to take failures positively. It is one that copes well with stress and anger, one that is calm and relaxed, one that is confident and full of self belief, one that respects and encourages others and that has the support and encouragement of friends and family. It is one that has fun and one that is true to itself. Whatever background or situation we come from, the one thing that we all have control over is our own minds. We can all improve our own health and happiness by nurturing our own positive beliefs and emotions and letting go of the negative. It is literally true that you are what you eat, and what we put in our mouths has a huge bearing on our physical and metal well being, determining whether or not we suffer illness and disease. When nutrition is discussed (which it rarely is by medical professionals), it nearly always focuses on the basic essentials of energy and protein, i.e. fuel and building blocks. But this is misleading since most of what we consume actually has too much energy (calories) and protein, while at the same time we are massively deficient in essential nutrients (hence the word nutrition) such as vitamins, minerals, anti-oxidants, enzymes and other phytochemicals. Protein and energy keep you alive in the short term and are essential for life, but only with complete nutrition can you achieve genuine health. Even when we talk about nutrients, we nearly always focus on reductionist ideas about individual nutrients such as Vitamin C, Calcium and Omega 3, leading to misguided and often dangerous food choices. But good nutrition is really really simple. Eat whole foods, and eat primarily plants. Whole plant foods contain the full spectrum of nutrients that our bodies need. You can’t eat too many vegetables! If you eat a mixture of whole fruits, vegetables, nuts, seeds, grains and beans then you really don’t need to spend time worrying about individual nutrients. And if you can eat some or all of it raw, then you’ll be getting the maximum nutritional value from the food you eat. Physical therapist Pete Egoscue believes that most of us in the modern world suffer from movement deficit disorder. I think he is bang on the money! We sit and eat, we sit and work, we sit ad drive, we sit and watch TV, we sit and play computer games and we sit and read. This is not what we evolved to do. We evolved to walk, run, climb, dig, carry and throw. As my Grandmother would say, we have become a society of “rotters”. Instead of exercising out bodies to develop peak health and fitness, we simply sit and rot. Only when we regularly put our whole bodies through their full range of motion do our bodies feel really good, and when we physically feel really good we also mentally feel really good. It is a positive reinforcement cycle. Make your exercises varied, frequent and do them in the most natural way that you can. Barefoot running and walking, swimming, climbing trees and rocks and yoga are all great ways to give your body a natural work out. Do as much as you can and you’ll feel the benefit. Purity in this context means freedom from toxins and I am using the word toxins in its broadest sense, meaning any external factor that poisons are mind or body and degrades or our health. It is true that some exposure to harmful things will make you stronger, but in our modern world we are overdoes with toxins that we have not evolved to deal with in such large doses (if at all) and which only serve to make us weaker. In our modern lives we are constantly hammered by toxic foods and drinks, drugs, radiation, chemicals, noise and negative social conditions. However, once you are aware of the toxins that you are exposed to, you can make an informed effort to minimise your exposure, whether that means using less harmful cosmetic products, eating more natural food, using less electronic devices or spending less time watching depressing stories on the news. The Health Triangle is about feeding out minds and bodies with an abundance of the good stuff that they need, which keeping out as much of the bad stuff as possible. Keep yourself pure, keep yourself positive, eat well and move often!